At VanQuoteDirect we often warn commercial vehicle owners to be wary when it comes to using traditional sat-navs to guide them to their destinations, as certain roads are inaccessible or dangerous for large or heavy vehicles. This is why many commercial vehicle fleet managers choose to invest in sat-navs that are specifically made for commercial vehicles, however these can often cost hundreds of pounds each. Those that work in the delivery industries will know that it can often be difficult to find somewhere suitable to park, especially if you own a particularly large vehicle and are delivering goods in an urban area. If this happens some commercial vehicle drivers try to park on private property for a short period of time while they deliver their packages, however many have found that they have come back to fixed penalty notices from traffic wardens. In some of our previous articles we have discussed organised spot checks on commercial vehicles throughout the UK; however these are often random and only take place in one town at a time. Yet in America they do things differently, as every year they have the annual nationwide commercial vehicle ‘Roadcheck’ where hundreds of trucks, buses, and other heavy commercial vehicles are pulled over to make sure that they are road legal and that the drivers are safe to be on the road. Commercial vehicle owners that use their vehicles when doing their jobs often find that parking fees can heavily reduce their earnings and overall income. Parking in city centres is generally extremely expensive, which is why in most cities commercial vehicles don’t have to pay if they are doing work in the immediate area. However, it has now been announced that commercial drivers will now have to pay normal parking fees in the downtown area of Portsmouth even if they are doing work. As we all know, the recession has created difficulties for many businesses, meaning that mangers are always trying to find ways to save money. 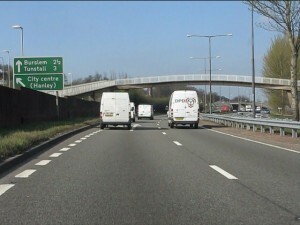 Companies that own commercial vehicles generally try to reduce costs by introducing on-board computers, or looking for cheap commercial vehicle insurance deals, however sometimes they have to make even more difficult decisions. Parking in public car parks can sometimes be extremely awkward for van owners, as many are not designed for vehicles that are over a certain size. Not only can it be difficult to manoeuvre around a car park, but finding a space big enough for a van can also be a problem, and there have been many instances of people claiming on their van insurance due to the fact they have had a knock or scrape whilst trying to park. A few weeks ago we reported how one man had created his own road signs to prevent lorries and other large commercial vehicles from travelling down unsuitable roads in his town. Large commercial vehicle drivers should be aware that if they are travelling to an area they do not have previous knowledge of they shouldn’t just rely on their sat-navs – especially if they are traditional versions that are meant for cars and therefore can guide lorry drivers down improper routes. Is your van affected by the Volkswagen emissions scandal? How can Commercial Vehicle pollution be reduced?